Solihull Tree Care services include the removal of trees, from felling to the disposal of everything, leaving your garden neat and tidy. We will log suitable parts of the tree and smaller branches will be chipped. Chippings may be used by you on your garden, providing useful mulch to keep down the weeds. Or if you prefer we can take these away. Wherever possible we will log the wood and you can keep these yourself for your logburner or open fire, or if you have no use for them we can remove. It's often a sad time to see a tree removed, especially when it's still a healthy specimen that has outgrown its welcome or just happens to be in the wrong place. But it never fails to amaze how much light is blocked by large trees that grow too close to a property. Removing trees can be a hazardous job and is best left to a professional tree surgeon. 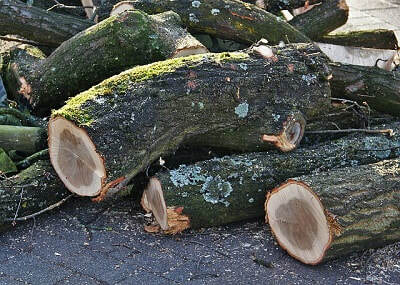 Once your tree has been felled, a decision needs to be made about the tree stump. Increasingly people are having tree trunks turned into pieces of art to be appreciated for many years. This is particularly suitable for harder wood which will stand the ravages of the British weather. But if you want your trees removed completely, we can either grind the stump to ground level or pull it from the earth, making good the ground around so you can re-landscape the area.